Like it or not, the facts on the negative effects of declawing cats are still up for debate. In many countries it is illegal and considered inhumane, while many in the United States claim that studies on the psychological and physiological damage to felines from declawing are inconclusive. However, the debate has allowed for many cat declawing alternatives to arise. Thus, it is totally up to the owner which method for dealing with cat behavior problems relating to clawing they choose. 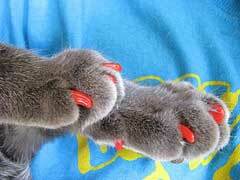 One alternative to conventional surgery is laser declawing for cats. The process uses a laser to remove the same bones as conventional declawing, but has a much shorter recovery time. Though it still surgery, many claim it causes less stress on the cat and requires fewer post-surgery painkillers. There are also thin, soft rubber caps available for purchase as cat declawing alternatives. The caps are easy to apply, cause no discomfort for the cat, and are economically priced. Many cats never even notice they’re there. Cat declawing alternatives like manually trimming your cat’s claws can be frustrating, so often the best alternative is simple patience and training. A cat scratching carpet or furniture will not respond to punishment; it will never understand how what it sees as a natural, pleasant impulse is “bad.” Thus, the best solution is to first obtain a sturdy, tall post that will not topple under a cat’s weight, and is covered in material best suited for scratching. Encourage your cat to use the post by playing around it, or rubbing it in catnip. You may need multiple posts, if your cat likes to scratch after just waking up, or in multiple rooms. Ultimately, any decision to declaw or seek cat declawing alternatives should be done only in the conscience of the owner.